The Obama DOJ set out to prove that Chicago PD was racist. Even if they had to slice some of the data away to reach that conclusion. MY OPEN LETTER TO CHICAGO: Stripping Context from Media & Government Reports on Police Abuse a Likely Cause of More American and Chicago Bloodshed. If you look at the category (sidebar, page down) for Cops Behaving Badly, you will see that I am not a blind supporter of the police, and certainly not of the Chicago PD, but if we are ever going to fix the crime in Chicago, and other major cities, then we have to look honestly at the data to see what is going on. That wasn’t done when the Obama DOJ looked a policing in Chicago. They set out to prove something. (Why clutter the issue with facts?) But if you don’t start with all the facts, you probably aren’t going to come up with a solution to the problem. Or you will miss the real problem. Here are some facts about policing in Chicago. The city of Chicago uses force against its citizens at a lower rate than nationally. 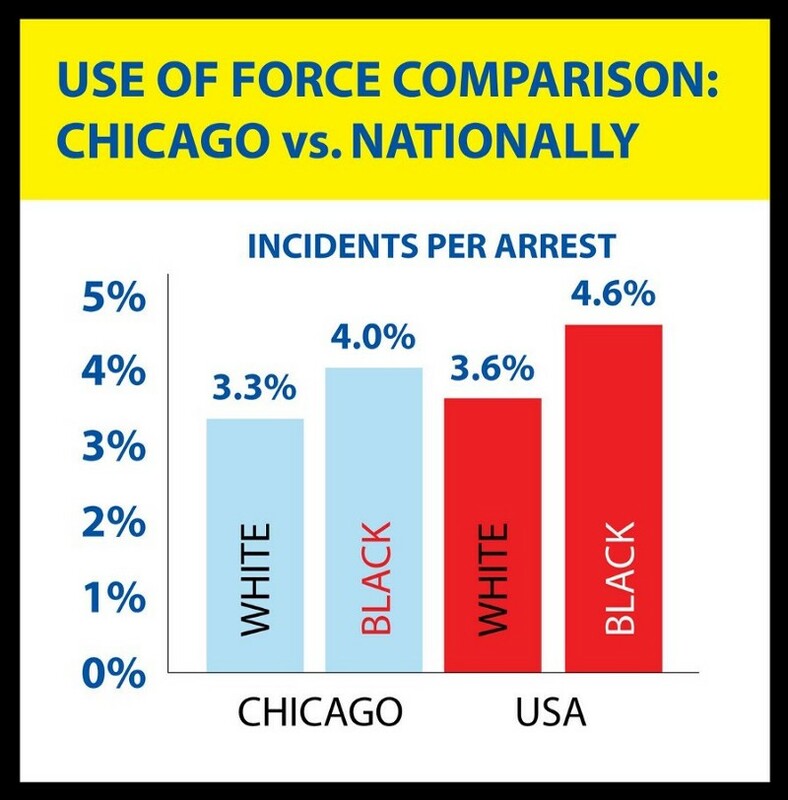 The small differences in the rates of use of force rate between blacks and whites is more equitable in Chicago than the national average. Use of force does not occur in 96% of white arrests and 96.7% of black arrests according the the same data used in the Obama-era U.S. Department of Justice Report to condemn CPD for using “excessive force.” Police shootings represent less than 1% of total shootings in the city, and police homicides less than 2% of the total. This is a long article, and there are a lot of statistics, but basically they say that Chicago police are not out-of-control monsters the media and the Obama-era DOJ want you to believe. They aren’t angels, but then who is? While sifting through the data and graphs, remember 1 fact: Chicago’s homicide rate is 28 per 100,000 people, while the country as a whole has a rate of 5 per 100,000 people. You can prove a lot of things using statistics, but if you slice away data you don’t like, or that doesn’t support your preconceptions about what the study should show, you have backpedaled into the realm of damn lies. It seems that is exactly what the politicians did when they decided to justify the consent decree. But then politics in Chicago has always been a matter of shading the truth. Hat tip Second City Cop. Who with the rest of the CPD will be stuck with the consent decree, that will likely do little to improve things in Chicago. “There are three kinds of lies: lies, damned lies and statistics.” Mark Twain attributed quote this to Benjamin Disraeli, but there is apparently some doubt about that. Chicago has paid out more than $670 million in police misconduct suits in the past 15 years. But the shenanigans of (former) Sgt. Ronald Watts and Det. Reynaldo Guevara could see that increase. And people wonder why Chicago is bankrupt. “We’ve had all kinds of police corruption, we’ve had police torture cases, but we’ve never had so many cases where there is clear evidence that police actually set people up for crimes they didn’t commit,” said Marshall Hatch, a prominent minister and activist on the city’s west side. Guevara has continually plead the 5th – to not incriminate himself – and claiming he “doesn’t remember” details, causing retrials to be thrown out. Watts made 500 arrests before he stole money from an undercover FBI agent and was arrested. Attorneys predict — and city officials fear — that Chicago’s tab for police misconduct is about to climb just as the city seemed close to closing the books on cases tied to Burge and his so-called Midnight Crew. Payouts around Jon Burge and the Midnight Crew topped more than 115 million dollars. (Though they may stretch back farther than those 15 years – I’m not sure.) They are worried that the payouts due to these 2 former officers could exceed that. If your not familiar with Jon Burge, and the Midnight Crew from Area 2, you can find a look at 1 case, that was not so unusual, at this Sun Times Story. That one case resulted in a 9 million dollar payout. Why are these payouts so large? Because what Watts and Guevara did, was truly awful. Jose Maysonet spent nearly 27 years in prison for a double murder in a Guevara case before prosecutors dropped the charges against him. And of course the knowledge that these cops lied to put people in jail makes it easier to prove the next case. A pattern of behavior. Cassell and Fowles quantified the costs of the decline in stop and frisks in human and financial terms. They found that, because of fewer stop and frisks in 2016, a conservative estimate is that approximately 236 additional homicides and 1115 additional shootings occurred during that year. A reasonable estimate of the social costs associated with these additional homicides and shootings is about $1,500,000,000. And these costs are heavily concentrated in Chicago’s African-American and Hispanic communities. Now when it comes to the Chicago PD, I am not a cheer leader. (All you have to do is look at the majority of the Cops Behaving Badly category, both here and at the archives.) But it doesn’t take an ACLU lawyer to understand that if you make it harder – or more dangerous in terms of losing their pensions – for cops to do their jobs, then the job of keeping the city safe will not get done, or not done as well. You may not think that is fair, but we don’t live in a world that is fair, we live in the Real World™ where actions and policy changes have consequences. Power Line has more enlightening commentary. Chicago is on track to spend $50 to $60 million more this year than last year on police overtime, with a negligible reduction in crime. 200 Million Dollars | Chicago Murder, Crime & Mayhem | HeyJackass! And 10 months after Mayor Emanuel promised a 1000 more cops, the department is ahead by 37 new officers. So it is hard to see that number going down much in the near future. Still, $200 million is ton of money. And for a 40% increase over 2016, you would expect some excellent result. For a window into the strange world of Chicago crime – which is much higher per capita than New York City – you can’t go wrong with Hey Jackass! Update – Just for reference: As of 8 AM Sunday, there were 8 murders and 23 wounded in Windy City. A scathing new report outlines big problems in the Chicago Police Department – racism, excessive force and a code of silence – and that’s not all. The Independent Police Review Authority – the organization assigned to investigate police – is described as badly broken. The findings aren’t surprising. The head of the Fraternal Order of Police is already pitching spin. (The report recommends changes to the union contracts – which is says is part of the problem.) I’m not holding my breath to see if things get better.